From Christmas to New Year’s, there are plenty of things happening to entertain people young and old, from favourites like the weekly Fire & Ice Show and Family Après to indoor playgrounds and even a gingerbread house for kids. Here are some events that occured over the 2018 Christmas holidays and into the New Year. Please check back for updates on 2019 events. Here are some events that occured for New Year's in 2018. Please check back for updates on 2019 events. Ring in the New Year in Whistler Village with a free and family-style celebration at several venues within the Village happening from noon to midnight. Brought to you by the Resort Municipality of Whistler and the Province of British Columbia, each venue is filled with lively entertainment, games, crafts, and activities. The festivities begin at noon with a special Family Après at Whistler Olympic Plaza and a variety of indoor activities at the Whistler Conference Centre. Later in the evening, bundle up and head to Skier’s Plaza for a special edition Fire & Ice show, plus dazzling fireworks displays at 8 PM and midnight. 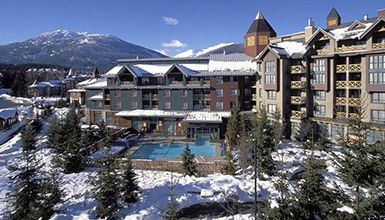 See complete schedule of events at the Resort Municipality of Whistler website. The Whistler New Year’s Eve Celebration is a family-friendly and alcohol-free event. The consumption of alcohol is only permitted at licensed venues. No need to drive – take free public transit within the Village from 6 PM to 4 AM. More information can be found at the Resort Municipality of Whistler website. Thanks to Whistler's eclectic nightlife scene, there are parties guaranteed at every pub and club in town and festive celebrations at local restaurants. Check back closer to the date for all 2018 New Year's Eve parties. Sitting down with friends and family for a special meal is a tradition for many people over the holiday season. Many of the restaurants in Whistler offer special Christmas and New Year’s dinners, brunches, lunches and catering options to make you feel right at home. View our dining guide for a full listing of restaurants and please contact them directly for reservations. Also, consider dining in with meal delivery and catering options. Stay in and cozy by the fire and have a festive dinner delivered to you. For the best experience and to dine at your preferred time, we recommend making reservations in advance. Explore winter packages for the best deals on accommodation, rentals and ski school during the festive season.